Zhenru Town has developed a cultural wall in the town center to introduce its history, cultures and landmarks to both residents and tourists. 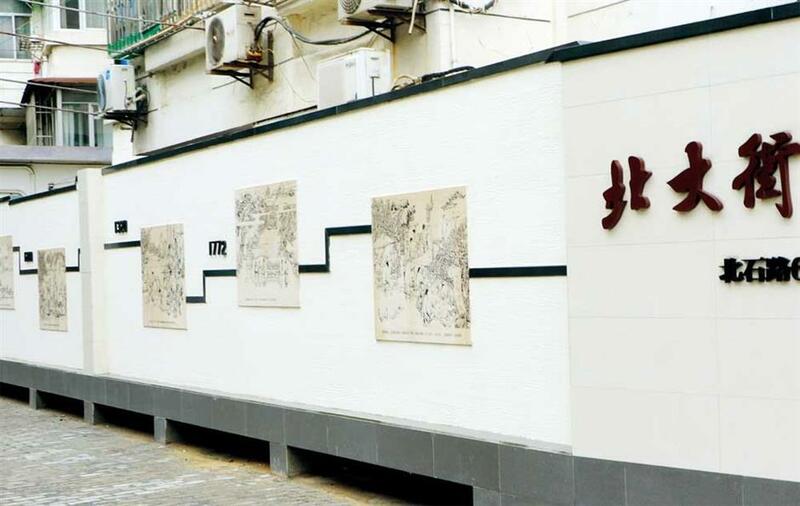 The cultural wall along the 174 Beishi Road Community features paintings illustrating Zhenru Town’s history and culture. THE historic Zhenru Town has developed a cultural wall in the town center to introduce its history, cultures and landmarks to both residents and tourists. The 300-meter wall of the 174 Beishi Road Community is near the Zhenru Station of Metro Line 11. It was renovated from a former stone wall. A series of traditional Chinese ink paintings were created on the wall detailing important historic scenes from the century-old town. The landmarks and costumes of people in various periods are well-painted. The paintings include the origin of the town’s iconic Zhenru Buddhism Temple, which dates back to the Southern Song Dynasty (1127-1279), the temple’s architectural features, the town’s historic specialties as well as historic tales from famous tourism spots in the town. The Zhenru Temple is neighboring the cultural wall for viewers to compare the historic paintings with the real structure, he added. Zhenru was originally formed around 1208 and 1224 during the Song Dynasty. A monk named Yong’an firstly developed the Zhenru Temple and built a Xianghua (or Scented Flower) Bridge, which brought worshippers to the area, according to one of the paintings. Markets were later developed around the temple, which became prosperous after a large number of believers came to burn scents. The temple was rebuilt and expanded during the Yuan Dynasty (1206-1368) , according to the paintings, suggesting the town was further developed. With a population of 177,500 now, the Zhenru area covering 6 square kilometers has become a sub-center of Shanghai. The township government plans to further improve the public facilities in the community. A walking path will be extended westward, houses will be renovated while the rainwater and sewage pipelines will be separated to improve the water quality of nearby waterways.